I went to buy a USB headset at the Dundas Radio Shack store this morning. I told the clerk (Alex S?) that I wanted to try a behind-the-ear headset since my current one pressed on my ears too hard and irritated them. 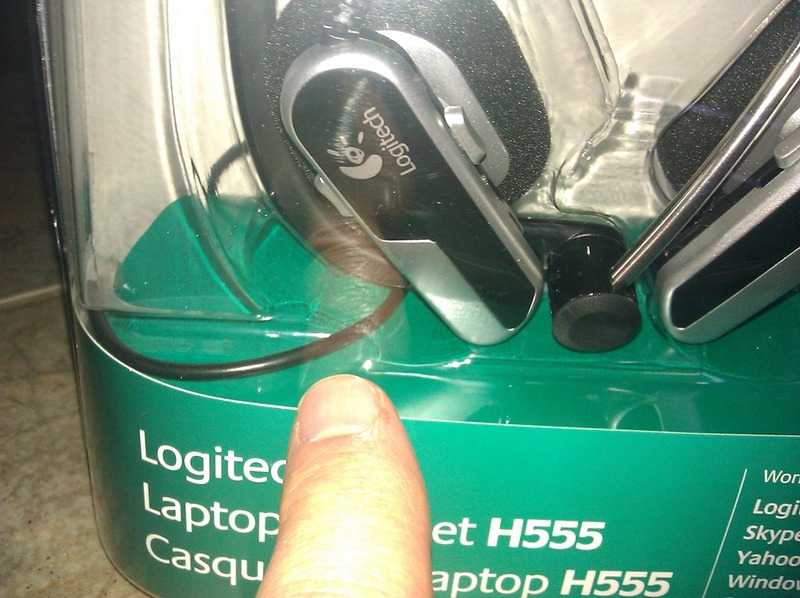 I picked out the Logitech Laptop Headset H555 and asked about bringing it back if I wasn’t happy. He said I could, within 30 days, with the original packaging. I then proceeded to show him that, even though the back of the clamshell package had "easy open" written on it, I couldn’t figure out how. He struggled with it for a bit but then discovered that he could push in hard along the edge with his fingers to break the seal. He started it for me and I left a happy customer. I got home and continued to push along the edge of the clamshell package. I made good progress on one side, halfway down, then did the other side. That side cracked inward instead of along the edge. I was afraid I’d cut my finger so I took a pair of scissors to cut the edge that remained. All went well until I noticed that one of the headset wires was cut. It had evidently snuggled up along the edge of the clamshell and I hadn’t noticed it when cutting the plastic. I went right back to the store and spoke with the manager, Torfinn Zempel. He sympathized but said since it happened out of the store, there was nothing he could do. Looking at the packaging (I never did open up the clamshell all the way), he said it looked to him like a flaw in the packaging because the headset cable/wire was up against the outside edge instead of nestled deep inside. Torfinn gave me the phone numbers for Logitech. I asked him to call Logitech but he said it was better if I did. I was obviously cautious and concerned about the dreaded clamshell packaging when I purchased the headset, so I think he should have gone to bat with Logitech for me. I didn’t argue much but I left really unhappy. I needed a headset for my business. Bought @Logitech headset from local @RadioShack Accidentally cut wire opening frickin plastic clamshell. They won’t take it back. Help? 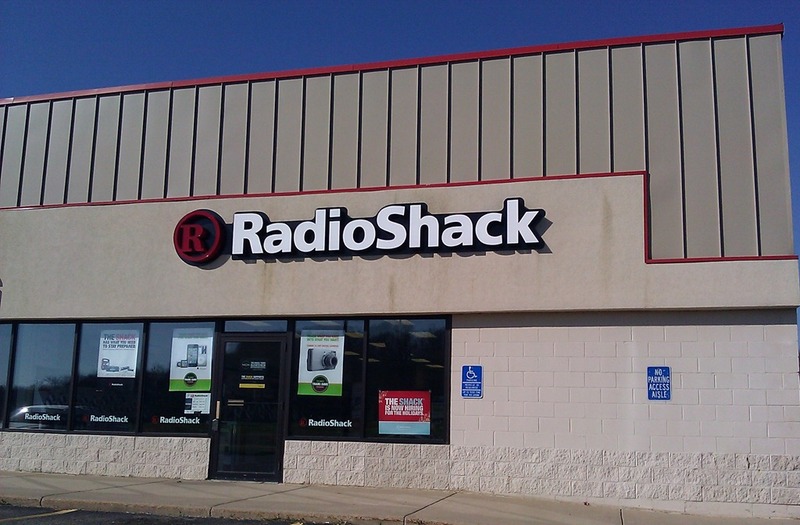 @griff_wigley Hey Griff-email us details @ help@radioshack.com (store info, receipt info, etc.) and we’ll be happy to try and help. I emailed them my story above with the photo. An hour later, I got a voicemail from Torfinn, telling me that they’d swap out the headset. When I went back to the store, I didn’t offer to tell him my Twitter story, waiting to see if he’d ask. He didn’t, but just said they’d contacted Logitech who said they could ship the damaged headset directly to them. I was curious about how it all unfolded behind the scenes but figured I’d just let it go. 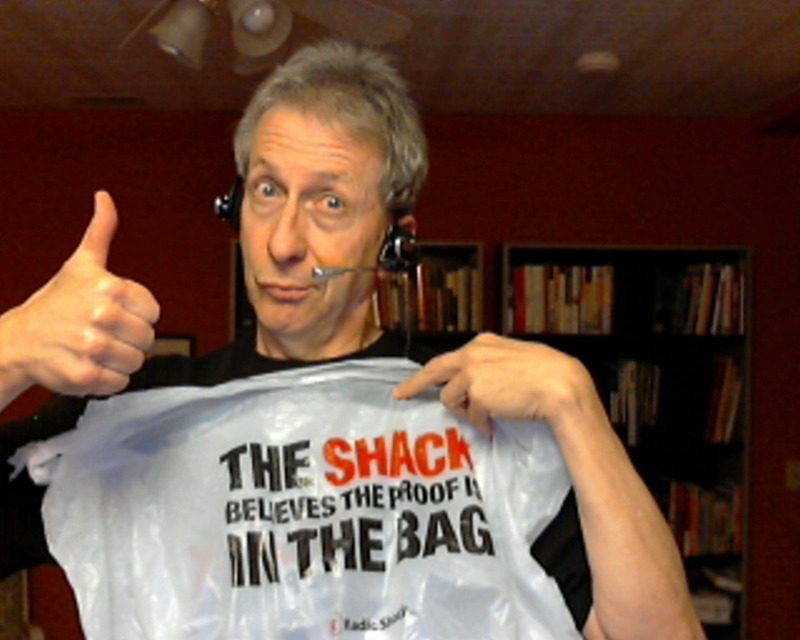 Here’s me, happy with my new Logitech headset, photo taken by my Logitech HD Webcam C260, purchased a few months ago at the very same Radio Shack store.